Progressive lenses: What are Progressive lenses and how to buy the best. 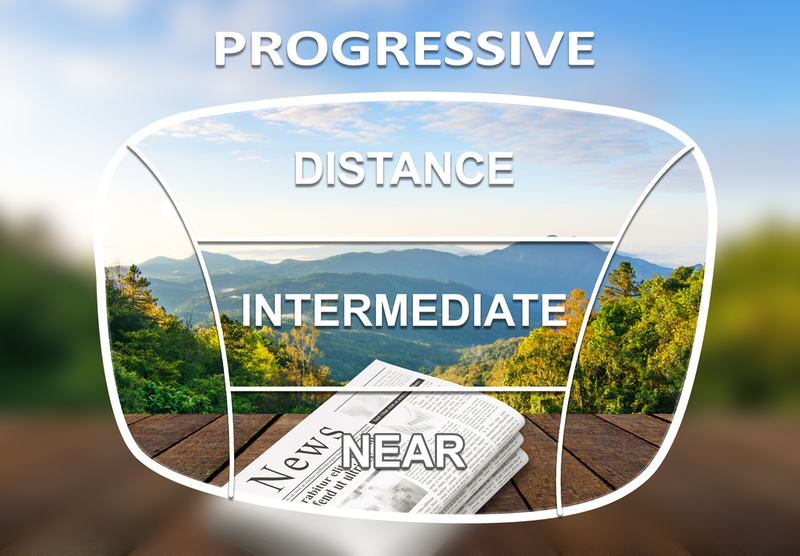 Progressive lenses are lenses made to correct the near, far and intermediate distances of vision. The lens provide a smooth transition between different lens powers and meant to correct Presbyopia without an aggressive jump between the different lens powers. Progressive lenses, an attribute of maturity. As we mature we gain several perks such as wisdom, independence and prosperity but the most of us will also require multifocal vision correction. The bifocal lenses, invented by American genius Benjamin Franklin are well known for hundreds of years and still have much popularity. 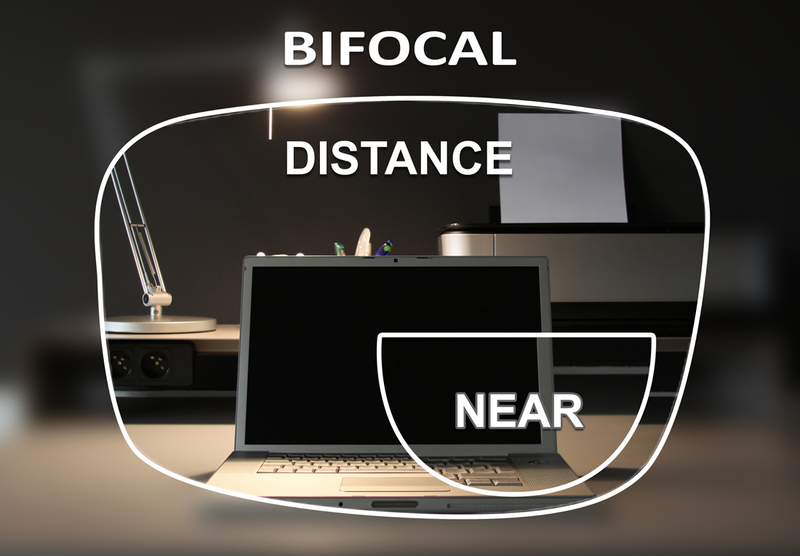 As the name states, a bifocal lens is meant to correct 2 distances of vision, and all that is between these ranges stay out of focus. Furthermore, the lens show a ‘D’ shaped window that proclaiming loudly ‘this person is old’. This is also true for Trifocal lenses, that has 3 instead of 2 windows and as well, requires these aggressive transitions (image jumps) between different vision corrections. Progressive lenses are the only solution that allows uninterrupted vision correction from farthest to closest objects, and designed to follow the natural movement of the eyes while adjusting the focus from distance to proximity. . In addition to the performance, Progressive lenses do not have a distinctive line or window that bi-focal or tri-focal lenses has, thus removing the loud declaration of age from the user’s face. Notice the clear visibility of the magnifying window. Our modern lives provide us with many new challenges for which a clear intermediate field of vision is a complete must. A perfect example for such can be: our office environment, which require us to be able to see clear our desk, keyboard, computer screen and the intermediate surrounding. The first experimental designs of progressive lenses appeared as early as 1907 but were only commercially available in 1955, offered by Younger optics. Compared with today’s advanced Freeform Progressive Lenses, these first progressives were relatively crude with serious problems of adaptation but yet, started the trend. Progressive lenses design was improved significantly by several manufactures and designers in the next 40 years. The significant improvement of adaptation and comfort happened during 1972, with the introduction of the Varilux2 design. In the early 90’s the problem of peripheral aberration and distortion was still a major cause of difficulty to adapt to progressive lenses and was determined to relate to the general design of the progressive lenses: The lens was designed having a clear vision area which located in the middle of the lens, above, through and below an optical center that is also known as the optical axis. The more your eye deviates outside this ‘magic’ corridor, you will experience an increased distortion, swim and sway effects. These affects are experienced differently and depends on the progressive lens design. Some designs did offer a wider area of reading and intermediate to try and counter these effects but designers had reached to a point that further improvements using existing technology was impossible.The first breakthrough came in April 1997, with Seiko’s first backside progressive addition lenses. 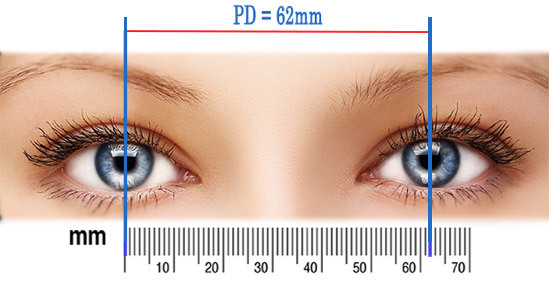 Seiko discovered that when moving the progressive lens design to the back of the lens it allowed the user a significantly lower distortion area, therefore a much wider viewing area. Other positive aspects included lower swim and sway affects which allowed faster adaptation and a lower rejection rate. As technology continued to evolve, faster and better computers are now able to control this digitally designed production which resulted in today’s most advanced high definition, freeform, digital progressive lenses. These type of lenses can be individually tailored to any user, his activities and needs. 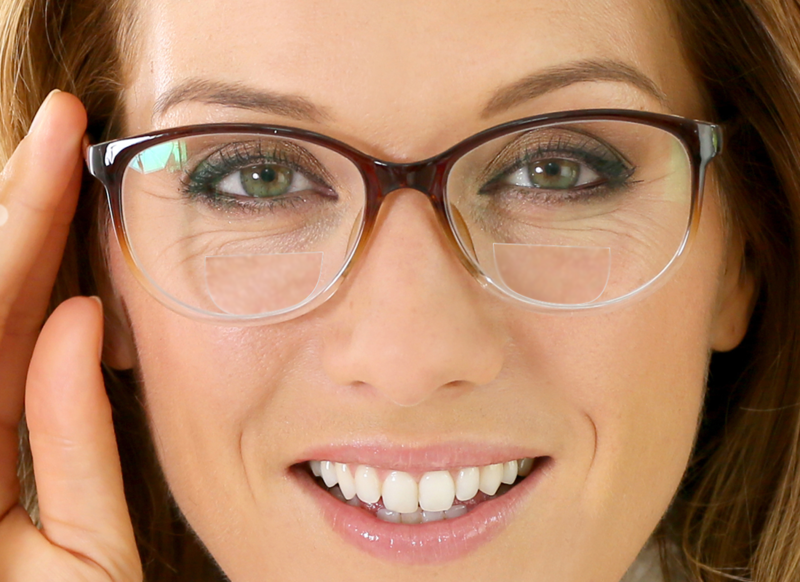 What Progressive Lenses Overnight Glasses Use? At overnight Glasses we use Seiko’s progressive lenses designs and together with the industry’s most advanced digital production equipment we are able to deliver one of the best progressive lenses seen in the market today. Our progressive lenses production, combined with our excellent Anti-Glare coating and Hard Coating, deliver a lens that improves your vision when conducting night driving, office work, and sport activities.